Around 3pm on Thursday 8 March my uncle dropped me at Adelaide Shores Resort for the Lets Get Stitched 2013 retreat. I arrived to the hugs of so many lovely ladies that I had know online for many years but not met in real life. The first to greet me was mo cabin mum for the weekend Wendy and then I dissolved into the arms of the gorgeous Dawn who had organised this retreat. 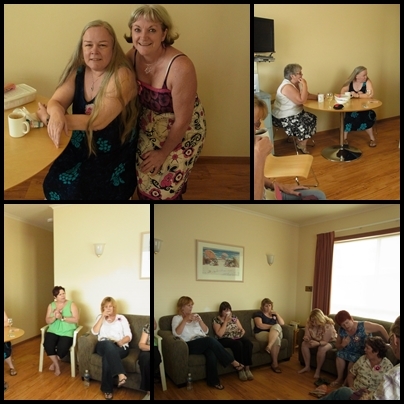 we then popped over to the Nutters executive cabin to meet the rest of the girls who started these weekends - Joy, Vicki & Fee. After Wendy & I picked Terri up from the airport (Terri was the only one I had previously met) we went to the cabin next door to meet quite a few more ladies. 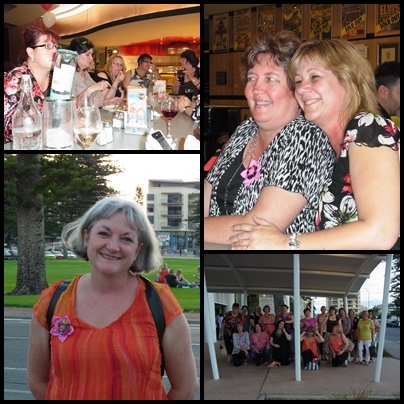 After all this excitement Wendy, Terri & I drove (well Wendy drove) to Semaphore Rd for dinner. 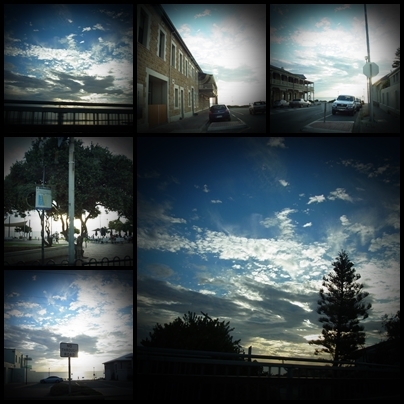 I took many random photos on the way. We ate at a lovely Greek restaurant, A taste of Greece, we all chose the same meal - a gorgeous cheese stuffed chicken breast. Made our way back to the resort, Terri & I went to bed early, while Wendy picked up the late arrivals from the airport. Friday was our bus trip to 3 quilt shops and Hahndorf, a wonderful German town in the Adelaide Hills. we only spent two hours there but had a lovely lunch and a little wander. 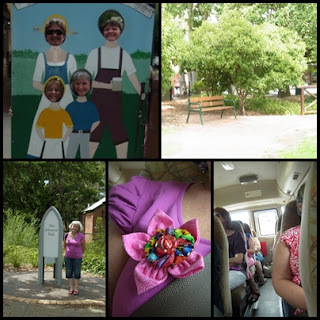 Middle bottom photo is the brooch I made from the fabric sent to us all so we could be identified at the airport as most of us had never met b4. 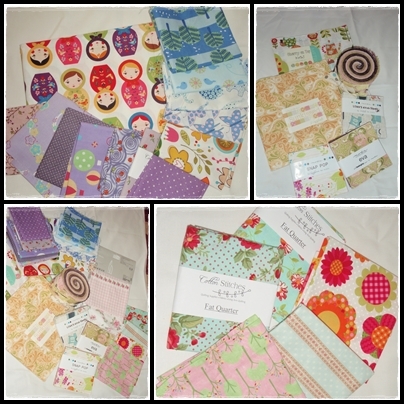 Here is my little stash of fabrics I bought over the weekend (one of the ladies bought part of her shop with here & there was a shop on Sunday as well as the 3 quilt shops we visited). The top left fabric is for Haylee's Babushka doll quilt that we will be working on together soon. The next photo is the pre-cuts that I just had to have. Bottom left is all my fabric purchases and the bottom right is fat 1/4 I bought just because they were pretty. I was very excited to see the Kerri had a supply of Basic Grey's Eva which is a very old line so I bought a charm pack as well as a jelly roll, I have never seen it in any of the fabric stores I buy from. I came in $5 under my alloted fabric budget so I was quite pleased with myself, I am not normally that restrained. Friday night was an absolute ball. we had pizza in the Nutters Cabin followed by a night of games & much much laughter. Saturday was a free day. So our cabin mum took us to Harbour town for a look around the direct factory shops. I didn't think the prices were much better at most of the shops but did manage to buy a few pieces of clothing and anew pair of black slides that I desperately needed. 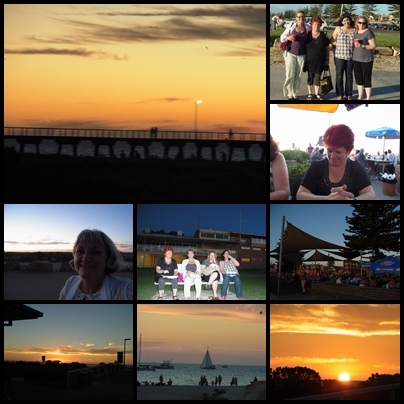 Saturday night we all went out to Glenelg for dinner at Watermark. was a lovely meal and another night of lots of fun and laughter. Did I mention that these girls, especially Narelle, are just so funny. So here we are at Sunday morning. This day was what the weekend was all about. The Nutters (first photo)- Joy from JoyPatch, Fee from Designs by Fee, Dawn from As Sweet as Cinnamon & Vicki from Pickledish patch, wanted to get together each year and share their designs with their on-line followers. 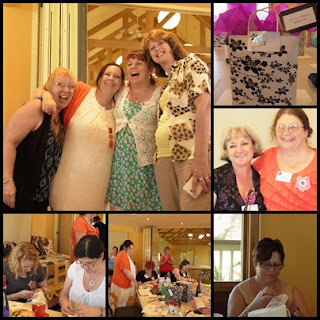 They invited two guest designers to join them Judy (my Adelaide host) from Judes stuff & Wendy from Sugarlane Quilts. Each one of us received a goodie bag with all 6 designs and some starter materials, a bottle of wine, small jars of jam, a very cute pair of scissors, bag of Fruchocs and a charm pack . 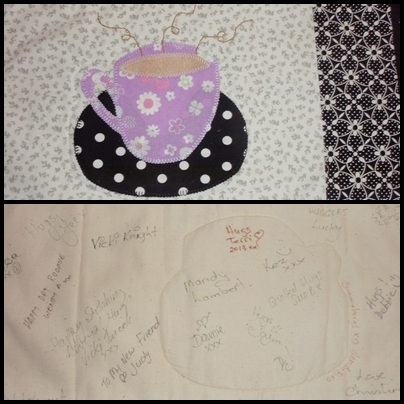 and a very beautiful mug rug each that everyone else signed, a fabulous momento of a great week end. 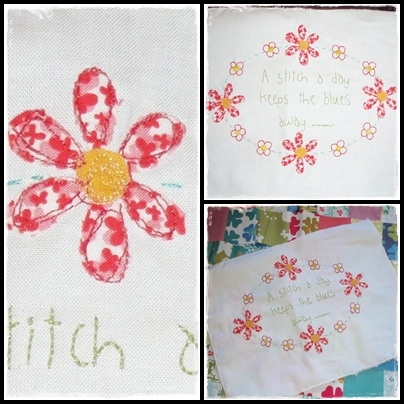 We could chose to start any of the designs to start on so I decided on Fee's design "A Stitch a Day Project bag. I have finished the stitchery and am working on the bag. When we got back to the resort we spent a little more time in the Nutters cabin for more fun and laughter before we all said a few goodbyes (some were leaving at the crack of dawn) and went to bed. Monday saw us all going our separate ways hoping to see each other one of the TWO Let's Get Stitched planned for next year, Melbourne in March & Hokitika, New Zealand, in September. If I go again I will probably do the NZ one. Well that's it - thank you if you stayed to the end of this very long post, please don't forget to leave me a message to let me know you popped by. Lovely post Gail. It was good to relive the weekend through your photos. Hopefully will meet up with you again next year. Thanks for sharing such great pictures, too, Gail. 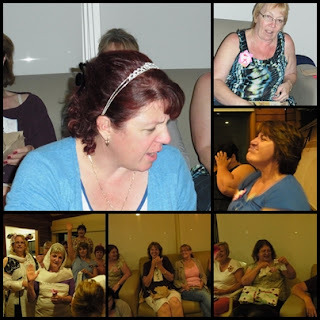 A fabulous recap of such a wonderful weekend Gail!! It will definitely be a memory (or whole bundle of memories, lol!) to remember for a lifetime!!! Looks like a great few days. 2 of my friends were there as well, Teresa and De. What a fabulous time Gail. You never know I might be able to make it 1 time! You summed it all up beautifully.